View Kmart Weekly Ad best deals. 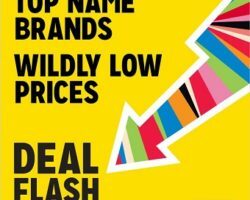 Get this Week Kmart Ad sale prices, grocery ad specials, weekly circulars, printable coupons, and offers. The company is the third largest discount store chain in the world, behind Walmart and Target. Kmart offers customers quality products through a portfolio of exclusive brands that include Adam Levine, Nicki Minaj, Jaclyn Smith, Joe Boxer, Route 66 and Smart Sense. Kmart Shop Your Way rewards program provides to it’s members special pricing, exclusive sales, events, access to celebrity brands and sweepstakes, up to 2% points on qualifying purchases, get 5% back in points when they buy online and pick-up in store, free 2-day shipping for most items or for orders $30+. Kmart Departments and Services: appliances, baby, clothing, electronics, grocery, health, beauty, home, jewelry, outdoor, shoes, sports, tools, toys, pet supplies, automotive.